Correct, there is a new bug introduced for the experimental branch as a result of previous fixes. Looking to make a minor update today with the fix for that but yeah, essentially remote stand ramp agent jobs duplicate causing mayhem. On experimental, yeah, default should be a bit more stable. Two important bug fixes coming up. Happy weekend all! Hello again! We’re back from the weekend with another great week of progress ahead of us on all fronts. Starting out with another experimental deployment, most likely the last one before we do another default deployment as we’ve now gotten rid of the job task and remote stand bugs with update -7. There may be further experimental updates later this week but as we’ve mentioned before we’re currently prioritizing development on localization, multiple floors and new turnaround services! Devs where is your april fool of the year and more important where is the aceo virtual reallity version? Alpha 30.1-8 has been deployed on the default branch! 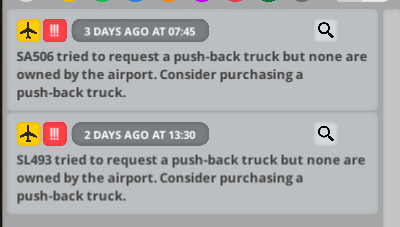 The push back request reports never remove themselfs. Why is the autoplanner not paused when you rescedule a flight? When you have 2 connected boarding desks, why cant you demolish 1 to free up the other? That would indeed be great! Not only for boarding desks but also busstop, etc (or any other upcoming stand connected/flight connected items) Would also be nice for check-in desks but that would mean that you should be able to ‘move’ the check-in connection to another desk (for future, probably Beta version). This feature would help a lot in re-shaping parts of the terminal etc! That was why I wondered about it, yes. Helloooo! Are you still here guys? Are we still playing this game?